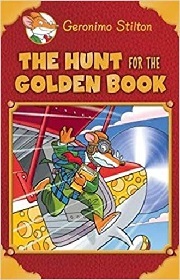 If your little one loves to read books which are full of adventures and excitement, then 'Geronimo Stilton - The Hunt for the Golden Book’ is just the right book for them. Geronimo Stilton is one of the most popular characters of children books. Kids have always shown a lot of interest in going on a ride full of mystery and adventures with him. This book has continued the legacy of bringing some of the most adventurous stories for kids. In the book, protagonist Geronimo Stilton is celebrating 10 years of success in the field of writing. He wishes to celebrate his success by writing his story and publishing it as a book. But some things are not destined to happen smoothly. How is he going to type and publish his book when his precious laptop is not with him anymore? It has been stolen somewhere and nowhere to be found now. Go through the exciting tale of this laptop search and his zest to write and publish his success story. Kids will be thrilled as adventure is not just limited to the hunt of the Golden book. This edition has a lot more to offer and keep you engaged. You get an extra surprise story of the lake monster in this edition. The Lake Monster is again a tale full of energy, excitement, conspiracies and lot of secrets. When people of Mouse Island saw a monster in the lake, they were terrified at first, but then they grew suspicions. They asked Geronimo Stilton to investigate the entire case and resolve the mystery of the monster. Little did they know that the mystery will reveal many secrets of the creature? Large number of jokes will give you a good laugh during entire reading.